True health and wellness are not just about alleviating the symptoms of illness but to live fully and at our best.My primary focus for my clients is to help them become the best that they can be by seeking a healthy mental, physical and emotional state with strong positive relationships and strength from spirituality or philosophy of life. My education and life experience prepared me to take a fully integrated approach with my clients by seeing the whole picture of mind-body as one complex system. My training has prepared me to provide cutting edge care based on the best science and research have to offer in the fields of Functional Medicine, clinical psychology, integrative psychiatry, alternative and integrative medicine. When we are in a state of optimal health our body, mind and spirit are functioning at their best. As a result, we feel enlivened, energetic and capable of realizing all of our goals. I have completed several advanced degrees. I have certifications in several specialties which includes, Functional Medicine, Addictions, Employee Assistance and child and adult psychiatry with a Psychiatric Mental Health Practitioner certification. 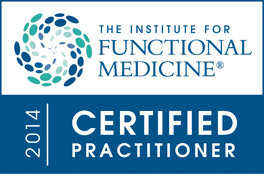 I have completed my certification in Functional Medicine which deepens my training into all systems of the body. It is important to seek a practitioner with certification. The training requires the equivalent of a doctoral degree in course work and academics as well as documented evidence of practice. Before you are able to take the exam you must present a case to the committee to be admitted into the Board Certification Examination for Functional Medicine (the training, knowledge and skill required are quite rigorous). I am pleased with the improvements I see in my clients when they come to believe they can be the best of who they are with treatments that are fully integrated. The process of healing through the use of an integrated mind body approach within the Functional Medicine model has been a phenomenal experience. I have seen people recover quickly in most instances and their suffering abated in such a way a new person emerges from the treatment. They feel fulfilled and gratified in their lives. Whatever their personal or professional goals, they have increased confidence that they can achieve them. I feel most gratified when they are in fulfilling and satisfying relationships. They are giving to others, and receiving in return in ways that are most important and thus define the true source of happiness and fulfillment in life: the love we receive and the love we give. I continue to receive and to provide education. I am a published author and contributor to several magazines. I am very pleased to hear from my readers and they appreciate the insights I provide. I have been a guest on TV shows, such as Channel Five News and Eye on Bergen County. I have been fortunate to receive the Outstanding Community Service award from Mt. Olive Baptist Church. In this way, of integrating various models of care that is truly holistic and engages the entire mind body system, I believe I am being the best I can be and I am fulfilled and rewarded by my clients’ progress. At FxMed Centers we provide the care you need to progress in your journey towards complete mental and physical health as well as the means to make the necessary changes. All the education and health recommendations are useless if you have not been provided with a means to make a change. To that end, FxMed Centers is a unique place providing the behavioral change specialists to help you reach your goals utilizing our proprietary behavior change model. Dr. Hoenig is a Family Medicine physician. She is a well trained generalist in all aspects of Family Medicine with a specialty focus in Women’s Health, hormones and Gynecology. She has completed rotations and specialty training in Complimentary and Alternative Medicine. Dr. Hoenig is board certified in Family Medicine and is a member of the American Academy of Family Physicians. Jenny is a Registered Dietician, Certified Dietician Nutritionist and Certified Diabetes Educator. She has very diverse experience applying her skills in nutrition education and counseling in several settings that includes corporate wellness, research and individual counseling and education. She is a regular Livestrong contributor in addition to other publications. Carrie is a registered dietician with a specialty in working with nutritional issues with medical diagnoses and for morbid obesity. Carrie is also a certified health coach. Cindy is a specialist in behavior change. She has demonstrated expertise in engaging clients of all ages in making significant changes in their behaviors and lifestyle. She has developed and run a specialty program on helping others to change long standing habits. Cindy is well known for her skill in motivating clients towards change. She has 20+ years of experience in practice and well regarded by her clients and colleagues as a talented and highly effective clinician. I am concerned primarily with concrete changes in a person’s real life, including actualizing their potential, promoting their growth, improving their efficiency and productivity at work, overcoming inhibitions, and resolving unhealthy patterns. I utilize various techniques, including strength focused interventions and humor in order to assist people in uncovering the behaviors, beliefs, values or emotions that are holding them back from leading a happy, productive and successful life. For close to 15 years, I have helped clients pave the way for lasting change. My approach is that of warm professionalism and a sense of humor, working alongside you to empower you to make changes you want or need in your life. I can help identify barriers and work to help reduce or eliminate them as well as highlighting your own strengths that already exist. The journey to optimal health lies within, and I am confident that I can help empower you to achieve that goal! I have been helping people to get to a better place in their lives for over 15 years. I have been with this group of professionals for about a decade and we work extremely well as a team. I am well known in the community and have worked with a diverse group of people with a variety of different issues and concerns. I enjoy helping people reach their goals and find it very satisfying to see the positive results. I am very supportive and help people find the positive solution they need. Tracy is a certified health and wellness coach. She has a degree in in social work with a strong background in helping clients develop and maintain a healthy lifestyle. She has experience in providing the same to individual as well as corporate clients. Dr. Gourdine and the team at FxMed Centers do not participate as in-network providers with any insurance companies. Coaching services are not covered by insurance. Although members of our team may be licensed clinicians, they are providing coaching which is not a licensed activity covered by insurance. If you require psychotherapy services you may register with our partner organization www.SpecializedTherapy.com. To receive a highly confidential consult directly with me please call 855-MYFXMED or 693-9633 or schedule@fxmedcenters.com. Start your journey with a team of professionals trained in the science of health. We are committed to helping you reach optimal health by identifying and treating the unique underlying causes of disease. We have provided you with resources to help you understand how the care we provide is different.